kids | mrs. and the misc. Furniture Style: Out With The Old, In With The New. I bet if you looked around your house, you have at least 1 piece of furniture that you dislike. It could be because you’ve had it forever, that it was a hand-me-down, or if you’re like me, it’s just plain ugly. I’ve had these 3 little tables in our garage forever. A few years back I used them outside and the table tops weren’t meant for it. I knew that eventually I would recover the tops and I FINALLY did it. Here’s what they looked like before. 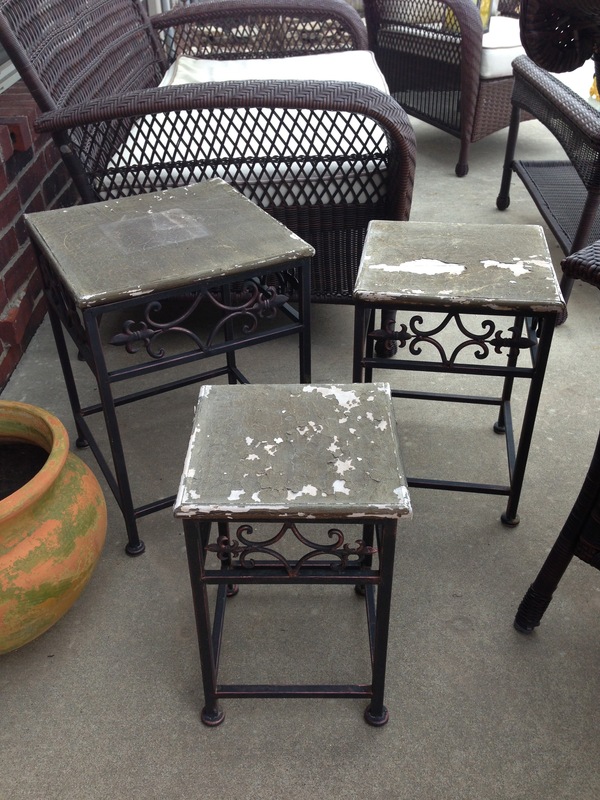 So ugly…but I knew the “bones” of the tables were solid. It was one of the easiest projects I’ve done in a while. I just had to unscrew all the screws, scrape off the tops of the tables and then use hot glue on the bottom side of each one. I ended up finding a fabric I loved at Joann’s on sale for $13 and it’s all weather material made for outdoors! My goal for this spring is to get fun pillows and really decorate our back patio. I want a whimsy vintage feel so this fabric fit right in. I can’t wait to get some potted plants for the tables and really make them feel complete. I scattered them a little so they aren’t all in a single space. I love how they turned out! A Wrapping Station To Fit Any Space!